Individuals make this valley the inspiring, engaged, dedicated, interesting, and intelligent community it is. Meet some of us. Teton Pass might be the most unique commute in the country. It is a square at the center of Jackson Hole’s community. Immediately south of Jackson Hole, the Wyoming Range is a contradiction, with some sections overused and others rarely visited. What does that mean for its role in the Greater Yellowstone Ecosystem? Look for flora instead of fauna, and you’re guaranteed a successful outing. You might even see some wildlife along the way. 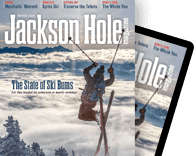 Jackson Hole has one of the highest rates of nonprofits per capita, ranging from Search & Rescue to food rescue. In Kelly, more than a dozen people live in yurts. But the housing style is the least interesting thing about this small community, which has been going strong since 1981. Greater Yellowstone’s extraordinary wildlife migrations make for an intact ecosystem, and bind people together in awe. Ice fishing’s glory days in Jackson Hole have passed, but this unique brand of angling still persists. His photos are timeless treasures.